Overall, Gardening Mama's menu was designed with new and younger players in mind. The multiplayer is under "Let's Play Together!" (which makes sense, but the downloadable Demo is again hidden within the Options menu. The opening credits are a little long, but not ridiculously so. The download speed is average, or maybe a little faster. All of the menu options are large, well-labeled, and have well-defined borders for tapping. Overall, the activities are simple, fun, and self-explanitory, with timing and accuracy being the challenges. It's not perfect: a few of the activities (like the digging in the downloadable Demo) don't make it obvious exactly what they're looking for. Howerver, there are fewer of those in this game than there were in Cooking Mama 2: Dinner With Friends, so there is improvement. Graphically, Gardening Mama is spot on with the Cooking Mama series: bright colors, simple artwork, and a little too cutesy. Audibly there is background music and sound effects. The sound effects can help, but aren't necessary if you can watch both screens at the same time. The music does add to the atmosphere. Feature-wise, there's plenty to play: sixteen (16) streaming mini games as well as a downloadable Demo. While this is a good amount for a game, it hasn't increased at all from Cooking Mama 2: Dinner With Friends. The Cooking Mama franchise is fun. That's why it keeps selling and that's why people keep buying. If you're staying away because it's Cooking, Gardening, or whatever, it's your own loss. How does Gardening Mama fare? In my humble opinion, it stands right alongside Cooking Mama 2, the game that came out prior to Gardening Mama. Obviously, all of the activities are themed to gardening, and some of the steps taken in game are to a much more in-depth level than many people would think of (decorating using plants, chemical mixtures for fertilizers, etc.). To clarify a common misconception: Cooking Mama games do NOT teach you to cook and Gardening Mama does NOT teach you to garden. Gardening Mama gives a better basis for learning, however, than the Cooking Mama game. You won't get information like how deep the holes should be, how much specific plants should be watered, how long different plants will take to grow and bloom, and how much sunlight some plant types need, but that information can easily be researched on the Internet after you get an idea of what's involved. For kids in school, this is a great way (again, in my humble opinion) to determine their interest and get them started. Back on topic, however: I had fun playing the game. The multiplayer and demo are great, and will last a while. You take the bad the the good, but there's far more good. Make some in-game demonstrations (which can be turned on or off by each player) available. Give "Multiplayer" its own menu. Offer more demo recipe options. Allow for the selection of a custom series of activities (that can also be downloaded). 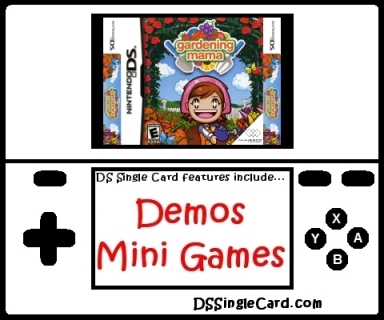 Include a full-on Single-Card Download Vs Play "Gardening Competition" mode. Provide an option for additional Demo downloads via Nintendo Wi-Fi Connection and make them Single-Card Download compatable.